ECOCO Eco Style Gel is an eco friendly hair styling gel. This product is a unique alternative to other gels for the fact that it is a Moroccan Argan Oil hair styling gel. This product was rated well by Amazon customers, on Amazon.com 76% of customers rated it with four or five stars. With an overall rating of 3.9 out of 5 stars. ECOCO is a natural hair gel without harsh chemicals such as alcohol. It is healthy for your hair and the environment. We will review this product and see if its natural ingredients work for you. ECOCO’s styling gel seems like a good product right from the start. If you are looking for a tight hold this product will great for you. Gel can leave a flaky residue as it dries and you go throughout the day. The Eco Style Gel's deep conditioning properties leave your hair flake free, and there is no need to worry about embarrassing dandruff flaking throughout the day. Overall the initial impression was a positive one, there seems to be plenty to like about the Eco Style Gel. This product is for environmentally minded individuals who are looking for the best styling gel. ECOCO styling gel features argan oil and its weightless hold and great shine. This particular product is alcohol free, there are not harsh chemicals to damage or break your hair. The eco style gel protects your hair from harsh UV rays. The gel is a natural product that will leave you with fresh, flake-free, and natural looking hair. The ingredients are comprised of carbopol 940, glycerin, dissolvine na-x, glycosperse L-20, fragrance, suttocide A, Tea 99%, PVPK-90 20%, Aquapro ii wp, olive oil, fd&c yellow 5, Argan Oil. This product is paraben and sulfate free. Argan Oil is a nutrient found in many moisturizers. This rich oil keeps your hair soft and your scalp moisturized. The Moroccan Argan Oil is preferred to other bulky moisturizing additives because it is pure and weightless. Chemically thickened gels can leave you with heavy clumps that are stubborn and make your hair uneven and chunky. Argan Oil is the preferred ingredient because unlike alternatives this oil keeps your hair light and weightless. The argan oil improves the luster and shine of your hair as well. All other ingredients in Eco Styling Hair Gel are used to improve hair performance and hair health. For example, carbopol is a thickening agent that gives the ECOCO Eco Styling Hair Gel its gel texture. Most gels contain alcohol for its preserving properties but ECOCO was able to blend its ingredients in such a way that Alcohol is not necessary to maintain this all natural product. The other ingredients help soften, strengthen, and hold your hair. ECOCO hair gel is for both men and women who want a stylish hair do. While hair gel does its primary job of holding a curl or keeping your spike nice and high on top of your head, natural hair gels also provide your scalp and hair with essential daily nutrients. It can protect, strengthen, soften, and moisturize. It helps hair of all types whether flat or frizzy. This natural Moroccan Argan Oil based product is environmentally friendly, organically based, and a non-hazardous product for your hair. The best hair product for great hold to ensure your hair doesn't move in a stiff wind would be gel. This naturally enhanced Eco Styling gel can tame even the thickest, coarsest, and most wiry hairs. The worst is when you have been running errands, working, or going about your busy day and your once perfectly sculpted hairdo flattens and flops flat on your head. With this Eco Styling gel, it helps eliminate any unwanted flattening or flopping. This product is so well received because it works for every type of hair. From thick, curly, and course hair to flat and wavy. ECOCO Eco Styling Professionals look to create and develop healthy and natural products for your hair. They were the first company to offer and hit the market with an alcohol-free hair gel. Along with this they also pride themselves on being able to offer more selections of gels than any other brand. Being the first to offer an alcohol-free hair gel is just one example of how ECOCO is constantly looking for healthy natural options in hair care. The company goal is to provide superior hair products that provide qualitative and effective results that are environmentally friendly. ECOCO's mission statement is "To unleash your individual style though quality products that care for your hair and the world we live in." Eco Styler Moroccan Argan Oil Styling Gel is vegan friendly and made in the United States of America.This product is versatile for all hair styles and is long lasting. This is a quick convenient answer to any unruly or flat hairs that need an all day hold to keep their shape. The argan oil gel not only holds but gives nutrients to you hair and scalp leaving you with soft hair and a healthy scalp. These all natural and vegan friendly ingredients are clean for your system and for the environment. The gel is very thick and can be a pain to clean off of your hands. The most common complaint was the packaging when the product was sent, there have been instances where the bottle was not wrapped properly and the container burst. ECOCO Eco Styler Moroccan Argan Oil Styling Gel is a great product and the reviews reflect that. If you want an environmentally safe product that will work, then use this product. Try this product for yourself and see if the results are what you are looking for in a natural hair gel. This 32 oz product is sure to last you for a long time and give you that look you desire. Follow the link below to Amazon.com to try it yourself. 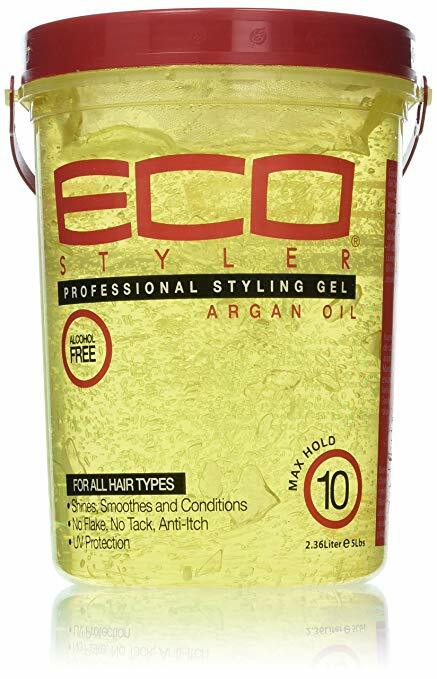 ECOCO Eco Styler Moroccan Aragan Oil Styling Gel is the go to product that both respects the environment and the need for strong, healthy, and good looking hair. This is a product that protects, hydrates, softens, and holds your hair for all day perfection. Many people have struggled with the packaging and receiving the product cracked or unsealed. Despite the packaging issues most customers are impressed with the results. This environmentally responsible product is incredibly affordable for only $7.89. If you are looking for an eco friendly and affordable product then try ECOCO's Eco Styler Moroccan Argan Oil Styling Gel today. Here are some top questions that I found for people seriously considering buying ECOCO Eco Styler Moroccan Argan Oil Styling Gel. How many ounces is it? It is 32 oz, which will last you months.